A clip of last night’s show! We had a great show last night! Thanks to everybody who came out and bought CDs and showed some serious love. Hamilton! Brent! Elijah! Rodney! Joe! Diana! Jess and Brian! Lisa and Dan! HERB(happy birthday)! and big thanks to my biggest fan, my MOM, who rose above technological difficulties and recorded this video! Most of the music we performed was original compositions from our new CD, John “THE SMOKER” Kocur. 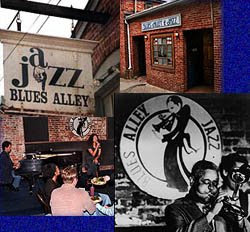 Blues Alley with John Kocur! This Tuesday, August 4th I’ll be performing as part of the John Kocur Quartet. John is a great alto player that I have been working with for the last year, and this Tuesday is his CD release party featuring his original compositions and the talents of Oliver Albertini on bass and C.V. Dashiell on drumset. Always a dynamic and energetic group, we will be playing two shows, 8 & 10pm! Come check us out, you can buy advance tickets on the Blues Alley website $18.